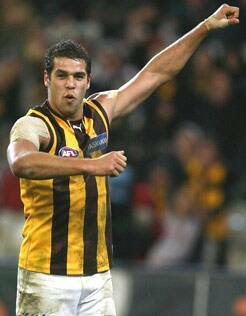 HAWTHORN, led by an eight-goal haul to the mercurial Lance Franklin, has defeated Collingwood by 54 points at the MCG on Friday night. The Hawks withstood a brief third-quarter rally from the Magpies to run out convincing winners, 17.14 (116) to 8.14 (62). With both teams coming off two losses in a row, the start was crucial and it was the Hawks that jumped out of the blocks, establishing a lead that Collingwood would never be able to breach. Stuart Dew, playing his first match since round 13, opened proceedings before Franklin and fellow tall Jarryd Roughead stretched the lead to a dangerous three goals. Scott Pendlebury got the Pies on the board but with the Hawks winning the clearances and a glut of possession, goals to Chance Bateman and another to Franklin (courtesy of a 50m penalty paid against his opponent Nick Maxwell) put them out to a 31-point lead at the first break. Poor finishing was the hallmark of the second term, with Hawthorn's 2.5 just eclipsed by the Pies' 2.6. At least Collingwood had staunched the flow of possession and despite trailing by an even five goals at half time, must have figured on a sneaky chance if a few black and white goals could be run together. The sneaky chance got bolder by the moment when play got under way in the third quarter as the Magpies reversed the trend of the first hour. Intensity replaced indecision and all of a sudden Collingwood was getting hands to the ball first and dominating possession. Three quick goals, to John Anthony, Pendlebury and Heath Shaw, followed and Collingwood were within 10 points and riding a wave of self-belief. But with Franklin roaming inside the Hawks' attacking 50, any entry there was potentially dangerous. And so it turned out with the Coleman medal favourite making the most of a Hawthorn forward foray to snap truly for his fifth. For a few moments, the game stepped up to something like a finals' type intensity. Collingwood's second wind was bringing a snappy response from the Hawks but the next goal was a disappointment, with a muffed kick-in gifting six points to Roughead. The moment ended Collingwood's resistance with quick goals to Stephen Gilham and Mark Williams taking the Hawks out to a 34-point three-quarter time lead. The last quarter was peripheral to the Buddy show. The freakishly gifted Hawk added another three to bring the curtain down on Collingwood's night. It remains to be seen whether the loss has a similar effect on the Pies' season. Sam Mitchell (35 disposals) and Jordan Lewis (38) contributed magnificently for the Hawks, with Luke Hodge setting up numerous opportunites from his 32 touches across half back. Pendlebury (24 disposals, two goals) and Alan Didak (28 disposals, one goal) were stand outs in a Collingwood team that gave a lot of effort but were simply outclassed by a superior opponent. The Magpies have now lost five of their last seven, and face St Kilda next week in a match that could have a huge impact on the make up of the final eight. The views expressed in this article are those of the author and not necessarily those of the AFL or clubs.